For shops and other businesses, the principle behind i-piggy rewards points is simple, you give something back to your customers to save and the benefits you gain from the extra business that results outweighs the cost of the reward given. Many outlets run their own schemes – e.g. in store vouchers or get a free coffee every 10 visits, but operating on your own, advertising costs etc. can be difficult to manage and measure the effectiveness of such schemes. Typically, the budget allocated to participating in a rewards programme is 2-3% of turnover. But, when well set up, the measured increase in turnover can be in the order of 15-30% – a very good return on investment. The above rules are used to drive particular outcomes – from straightforward customer retention and acquisition strategies to the more subtle: such as encouragement to shop on a quiet day of the week or during a holiday period – or an incentive to spend just a bit more. Additionally, the scheme manager (ISM) in your area may invite you to participate in a town-wide promotion designed to increase general footfall that will benefit all partners in the area. Guidance is provided on how to create true incentives to meet objectives and not give points away unnecessarily by just subsidising customers. Points rules can be time limited to meet both short and long term requirements and so you can keep your offers fresh. 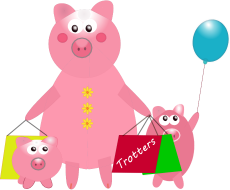 Members will know that you are an i-piggy partner via a displayed logo. The can also find you and view the points you offer in your i-piggy business entry via their i-piggy login page or smartphone App but better still, any last minute offers and deals that you post are instantly visible to Members. Local offers and promotions are always displayed to members preferentially.